This hammer is meant for breaking up concrete or stone flooring. This hammer comes with the hammer, a chisel point, a pencil point, a 12 gauge 50′ extension cord, and a cart. Your job site must be within 50′ of a standard 110v power supply. This item requires a standard 110v power supply. The end-user of this product must come in to our location to receive proper training and safety procedures for this item. SKU: HFA01. Categories: Tools & Equipment, Concrete Tools, Plumbing Equipment, Power Tools/Hand Tools. Tags: breaker hammer, jack hammer. This hammer is meant for breaking up concrete, brick, or stone floors or walls. This hammer comes with the hammer, a chisel point, and a pencil point. This item requires a standard 110v power supply. The end-user of this product must come in to our location to receive proper training and safety procedures for this item. Rotary hammers are use to drill holes in concrete or brick. We carry 3/16″, 3/8″, 1/2″, and 5/8″ bits for this rotary hammer. We also carry a large rotary hammer for larger holes which is rented separately. This item requires a standard 110v power supply. 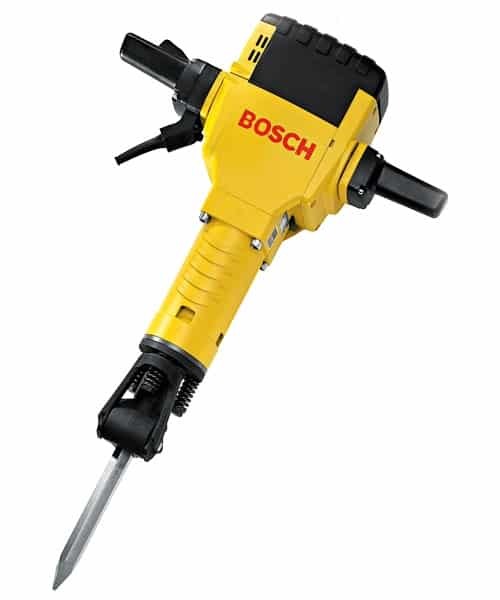 Rotary hammers are use to drill holes in concrete or brick. We carry 1/2″, 5/8″, 3/4″, 7/8″, 1″, 1 1/8″, 1 1/4″, and 1 1/2″ bits for this rotary hammer. We also carry a small rotary hammer for smaller holes which is rented separately. This item requires a standard 110v power supply.